This wonderful yew (Taxus bacata) slowly absorbed the county boundary wall in Leigh Woods (Bristol) for many years, blocks of stone can be seen partly engulfed by the trunk. Relatively recently the wall has been reshaped to allow the tree room to grow freely and the trunk will continue to thicken. This tree might have been there before the wall was first built, maybe it was even treated as a boundary marker itself. It is very hard to tell the age of any living tree as their growth rate can vary considerably depending on genetics, climate, location, and health. 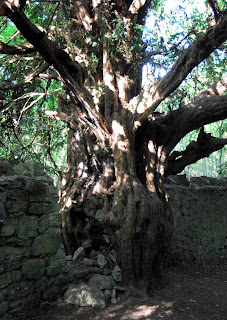 However yews live to prodigious ages and there are yews in Britain estimated to be more than 5,000 years old. 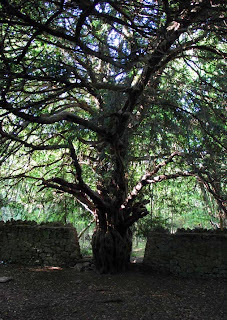 For plenty of facinating information about Britains ancient yews visit the site of the Ancient Yew Group.